Laverda motorcycle books covers the history, racing heritage and restoration of Laverda motorcycles, plus a range of Laverda manuals. Laverda is an Italian manufacturer of combine harvesters and one-time a manufacturer of high performance motorcycles. 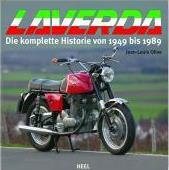 The roots of the Laverda Motorcycle company go back to 1873. 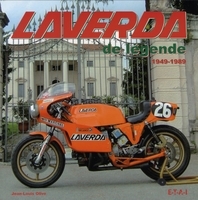 Laverda by Raymond Ainscoe (1991). With Tim Parker. Covers the production machines and racing exploits of the long-established company Laverda, with road tests and contributions from designers, workers and riders. Laverda Performance Portfolio 1978-1988 by R M Clarke (2000). Jota 1200 and Anniversary Special. Reprinted articles from major magazines Modern Cycle, Cycle World, Motorcyclist and others deal specifically with these popular Laverda models - Formula Mirage, TS, America, 1000-20, RGA, RGS 1000 and Corsa, SFC 750 and 1000, and Motodd. Filled with road and comparison tests, specs, model introductions and performance data. Laverda Jota Performance Portfolio 1976-1985 by R M Clarke (2000). Reprinted articles from major magazines Modern Cycle, Cycle World, Motorcyclist and others deal specifically with these popular Laverda models - 1000 3CE, 120, 1200 & America, Formula, Special, RGA 1000 and 120. Filled with road and comparison tests, specs, model introductions, and performance data. Laverda Gold Portfolio 1967-1977 by R M Clarke (1997) includes 37 articles giving information on road, comparison, racer and track tests. 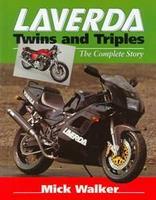 The Laverda Twins & Triples Bible: 650 & 750cc Twins, 1000 & 1200cc Triples by Ian Falloon (2007). Although now defunct as a producer of motorcycles, Laverda has acquired a following of almost fanatical proportion. The large capacity twins and triples are some of the most charismatic and exciting motorcycles produced in a golden era. With a successful endurance racing program publicizing them, Laverda's twins soon earned a reputation for durability that wasn't usually associated with Italian machinery. Originally built for the British market, the 1000cc Jota was the fastest Superbike available in its day. While the twins faded before the end of the 1970s, the triples continued for almost another decade before dying with a whimper. By this time the company was in serious difficulty and went into receivership. Despite a resurrection in the 1990s, it is the classic twins and triples of the late 1960s through until the mid-1980s that Laverda is now famous. 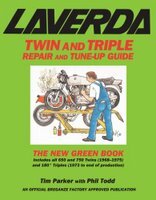 Laverda Twin And Triple Repair And Tune-up Guide by Tim Parker (2008).With Phil Todd. Full data and step-by-step fix-it information for the 1970s and 1980s big Laverda motorcycles highly favoured by many collectors: recognized as the first superbike. 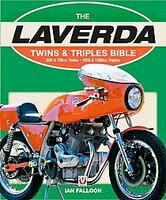 Laverda Twins And Triples: The Complete Story by Mick Walker (1999) charts the history of this legendary Italian marque from its inception in the 1940s through its highs in the 1960s, its lows in the 1980s, and its current return to Europe's elite and innovative class of motorcycle makers. Topics covered include a background history of the company, complete development histories and specifications for all Laverda twins and triples.